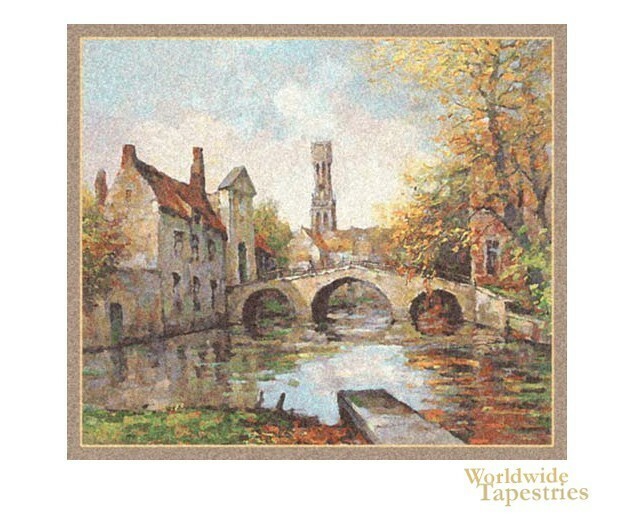 The beautiful Lake of Love in Bruges is depicted here in this tapestry. The city of Bruges was a commercial center of Europe in medieval times, and a visit to this part of Belgium is like travel back in time to this period, as unlike many parts of Europe, this area was not destroyed by war. This city therefore retains its charms for visitors and this lake and bridge is known as the Lake of Love. Back in the middle ages, it was part of the busy harbor system of Bruges used for trade and transport. Now this city is well known for its charm and attracts many travellers in search of a pristine medieval city to visit. This tapestry shows off the charm and beauty of this place well. This tapestry Lake of Love is backed with lining and tunnel for easy hanging. Dimensions: W 20" x H 17"